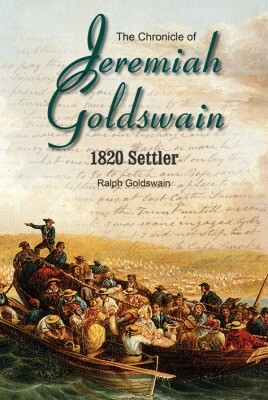 This is the story of the 1820 Settler, Jeremiah Goldswain, in his own words. After thirty-eight years on the eastern boundary of the Cape Colony, he sat down to write his memoirs. Unfortunately, due to sales rights restrictions, we cannot offer The Chronicle of Jeremiah Goldswain for sale in your country. This is the story of the 1820 Settler, Jeremiah Goldswain, in his own words. After thirty-eight years on the eastern boundary of the Cape Colony, he sat down to write his memoirs. It is a close-up view of four decades during a period when the British Empire was expanding in southern Africa, with the borders being pushed ever farther into the hinterland by successive governors. As a result, there was constant conflict between the African tribes and the colonists. Jeremiah was directly involved in three of the nine Frontier Wars that occurred between 1779 and 1879. It is the story of hardship and the struggle for survival of Jeremiah and his family—his wife Eliza and their ten children—on one of the most volatile borders the world has ever seen. Even in peacetime the conflict and violent clash of cultures were constantly present and many settlers were murdered, including members of Jeremiah's family. Through all this we see a man making his way in a world he could not have imagined while growing up in rural Buckinghamshire. He lived during an important historical time for South Africa, not only observing and fighting the wars, but meeting and serving with some of the most famous names in South African history. He saw, in detail, the effects of the Cattle Killing of 1856, the Boer uprising in the Orange River Sovereignty, as well as several other famous and notorious historical events. The text has been published once only—by the van Riebeeck Society in 1949—and since then has been used by scholars and historians as a primary source. It has not been widely read, because Jeremiah had no education, and although he had an extraordinary ability to describe experience and express his emotions, he was a stranger to the conventions of written language. Now Ralph Goldswain has transcribed the original text into an accessible account of forty years of frontier history.